Looking for a fun layered drink to impress kids and adults alike? 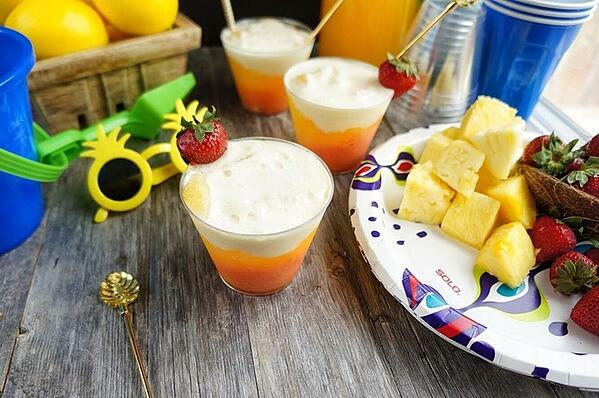 Try these layered mango coconut mocktails! Their tropical flavor and frosty chill are the perfect combination for a fun summer drink! I can’t believe August is almost half way over! Summer temps in Chicago are in the 90s, so the flip flops are still out in full force, and we are taking advantage of any beach day we can get. This is such a fun time of year because my two nieces LOVE going to the beach and having some fun in the sun. All this fun is going to need an amazing summertime drink to go along with it, and I have teamed up with Solo to create the perfect recipe for you today: a Layered Mango Coconut Mocktail! This frosty beverage was a hit with my nieces because of the super fun layering we did with Solo’s Clear 9 oz plastic cups. They’re the perfect size for kids and clear so you can see the gorgeous red and yellow colors layered as you sip! There is nothing better on a hot summer day than a refreshing, slushie, fruity drink. I love lounging at the beach with a fruity frozen drink by my side, and bonus points if it’s pretty! 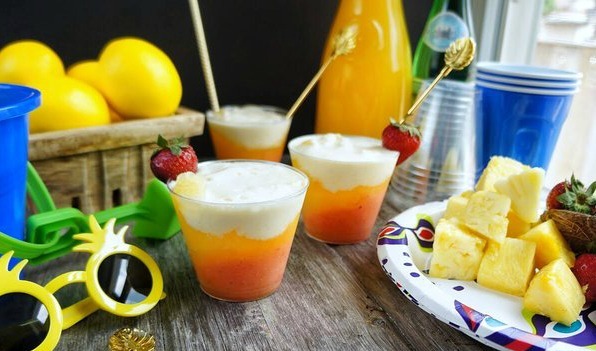 This layered mango coconut mocktail is the perfect drink for lounging at the beach, hanging with friends at a backyard barbeque, or a fun family night. It’s a mocktail–no alcohol, of course–so everyone can enjoy it, and I’m telling you: everyone will WANT to! It’s that good. This summer I’ve been all about the fruits. Strawberries, mango, pineapple–I love it all, especially in this time of year because it tastes amazing! I love buying fruit in big packages–I keep half of it fresh in the fridge, and then slice or chop the other half and keep it in the freezer. In this case, I brought the fresh fruit to the beach to serve as a healthy snack for the girls on Solo’s paper plates with their fun design for summer. The frozen fruit makes the best smoothies and slushies, just like this one. Using frozen fruit instead of more ice means your drink doesn’t taste watered down, even after an hour or two in the sun! You’ll have a hard time telling me that this drink doesn’t seriously brighten up your day. The different colors of the different layers remind me exactly of the most gorgeous summertime sunset –pink, orange, pale yellow all swirled together. It’s super easy to throw together this layered mango coconut mocktail–you’ll need some fresh and frozen fruit, lots of ice, a fruity carbonated water, and a good blender. I recommending measuring and prepping all the ingredients before you get started blending, that way your slushie goodness won’t melt while waiting for you to prep the next layer. 1. 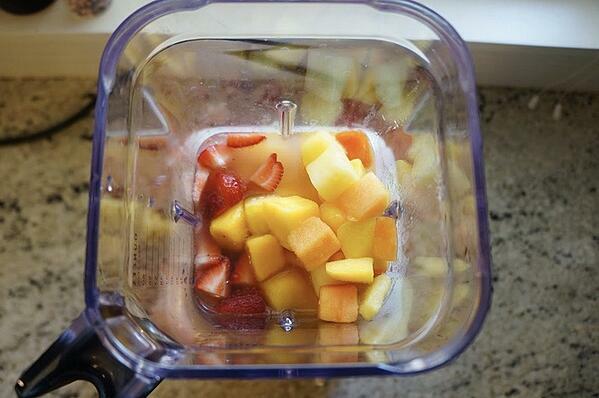 Blend the Berry Mango layer first. 2. Rinse out the blender. Add the ice and Tampico for the middle layer of your slush. Blend until all ice is crushed. If necessary, add a little extra ice until you achieve the desired consistency. Spoon this layer carefully on top of the Berry Mango layer. 3. Rinse out the blender a second time. 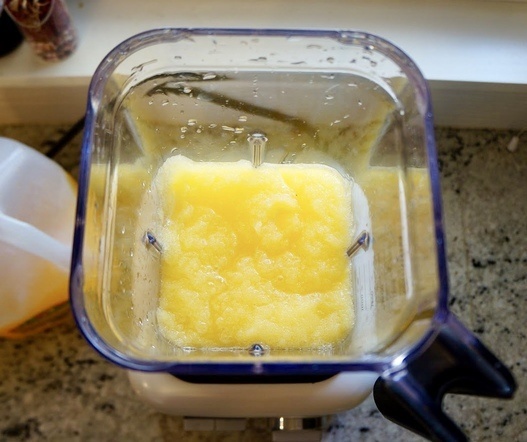 Add the Coconut Pineapple slush ingredients to the blender. Blend the Coconut Pineapple ingredients until slushy. Use a spoon again to layer the slush on top of the other two layers, filling the glasses to the top. The slushie at this point will start to swirl together a bit and create a beautiful mix of colors. Claire and Quinn put different amounts in each of their drinks so to put their own artistic touch on it. I loved that you could see the differences in each design in Solo’s Clear 9 oz plastic cups! 4. Serve your layered mango coconut mocktails immediately, and wait for the the grin to spread across their faces! 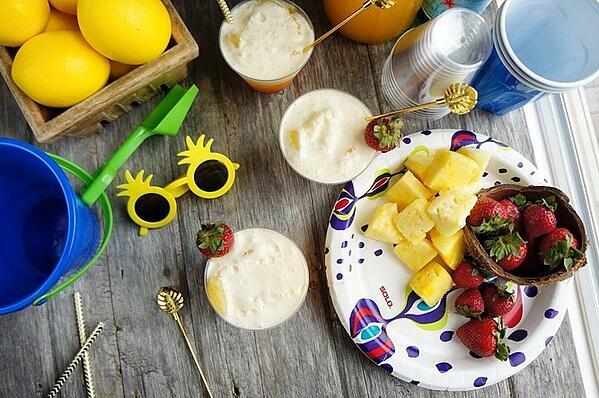 Looking for more fun ideas for a summer gathering? 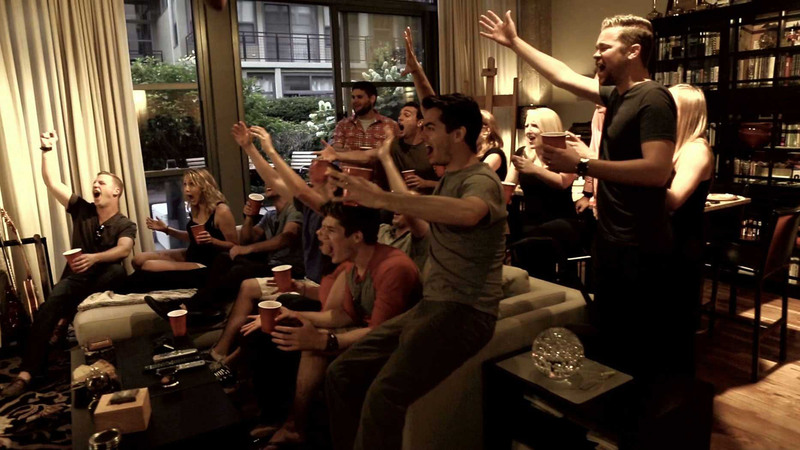 Check out our Guide to the Ultimate Summer Party! This post was created by Nicole Triebe of Windy City Dinner Fairy. Nicole is a classically trained pastry chef turned blogger and food stylist, who uses her culinary skill and artistic sense to create beautiful meals and culinary scenes.